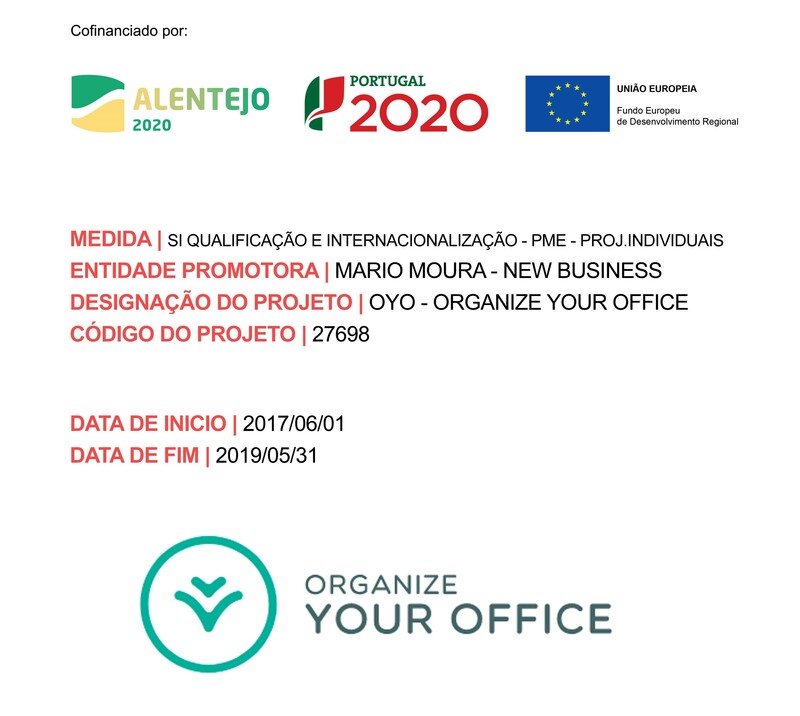 The company Mário Moura New Business, creator and owner of the OyO brand | Organize Your Office, respects the privacy of visitors to oyo.pt and takes great care to protect their information. Personal information such as your name, address, e-mail address, telephone, NIF, etc. can be requested. The above information may be requested when you register or fill out a contact form, and / or when you receive or send electronic mail and for services that require registration or subscription. The information collected is intended to send information / disclosure by electronic mail, telephone contact or SMS messages about our products and services. The sending of information only occurs when the data owner has expressly chosen to receive emails, telephone contact and / or SMS messages from Mário Moura New Business. If you do not wish to receive further e-mails, telephone contact and / or SMS, please contact us by email or letter to our address. Your personal data may be processed within the Mário Moura Business Group and / or by companies that provide services on our behalf. We only share the personal information required to perform such services. We require all companies with whom we share personal information to protect the data in accordance with this policy and to limit the use of such personal information to the performance of services for Mário Moura New Business. We do not sell or otherwise provide personal information to other companies to market their services or products. The information you provide to us when you visit our site is protected by the implementation of various security measures, namely through conditional access, and safeguarding the confidentiality of information. We caution, however, that by providing personal information online, there is a risk that third parties may intercept and use this information, so in terms of the security of any information you post online; you will do so at your own risk. Mário Moura New Business is committed to protecting the privacy of children and does not intend to collect personal information from minors under the age of 13 (the age legally defined in terms of national law under the RGPD). We encourage parents and guardians of children under the age of 13 to regularly monitor and supervise the use of electronic mail and other online activities for children. If you wish, you can cancel your registration or use at any time and you can choose not to receive any e-mails, phone calls and / or SMS messages, and you may also choose to delete all your personal information from our database. If you wish, you can also unsubscribe, delete or modify your personal information. The data subject has the right to receive a copy of your personal information in our possession. The company reserves the right to charge a small fee (amount to be defined) for administrative and computer costs of any request made. If you are a user of our site through the user registration process, your data will be stored in a specific user control database. However, the Data Holder may require its deletion whenever you wish via email to dpo@oyo.pt. Try Free for 15 days. No commitments!